"I'm Detective Lombardo, and this is my partner Detective Vaveli. Life as a detective is pretty hard, what with solving cases and all. What makes it more difficult is when said detectives get in bed with the criminals they're supposed to be investigating. When things go south, those detectives can't really blame anyone but themselves and in Partners, things really go go south. Fast. Partners is written by Glenn Møane, illustrated by Elias Martins and colored by Russell Vincent Yu. With their hands full doing hits for the mob, homicide detectives Stephen Vaveli and Joe Lombardo find themselves in a tough spot when they try to catch a ruthless killer who preys on children. Inspired by events that led to the conviction of two NYPD detectives in 2006, Partners is a hardboiled crime noir story about loyalty, ethics and the consequences of doing business with the devil. 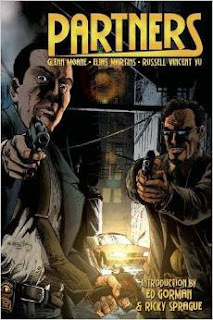 Vaveli and Lombardo are two dirty cops forced to reconcile their day job of investigating murders with their night job of working for the mob. In that sense, Møane strikes a fairly even balance in presenting both sides of the coin, as the two detectives are clearly dirty. Their allegiances are questioned in their latest case, which quickly takes a pretty dark turn and adds a level of grit to the story that makes it feel much more mature. In fact, the strongest part of Partners is Møane's characterization of the two detectives, as they're characterized as very conflicted individuals who are content with being dirty. Møane actually unfolds a pretty solid story with very even pacing throughout and the reader uncovers things about the investigation alongside the detectives that throws other things into question. Most of the book is illustrated in a way that reflects the somewhat evil nature of the characters. The setting presented in the book trades in dark alleys and nighttime scenes, the majority of which grounds the book in seedy exchanges. Martins' characters look a little cartoonish in many regards, as facial expressions seem a little exaggerated at times. Martins does blend together a good mix of characters and settings in the panels, helping to realize a fully created world in the book. Yu's colors stick to the primary range, generally accenting the illustrations well. Partners is an interesting police procedural focused on two corrupt detectives trying to survive two worlds. Vaveli and Lombardo are strong leads with desires to be good detectives polluted by thoughts of criminal activities. Møane's story is straightforward and offers a surprising twist at the end, maintaining a grounding in the notion that there are some cops who are content with working both sides of the law. Martins' illustrations are effective at capturing the general criminal element pervasive on the streets the two detectives patrol. Partners is a good read if you're looking for a book about detectives playing both sides of justice. Partners is in stores August 3.